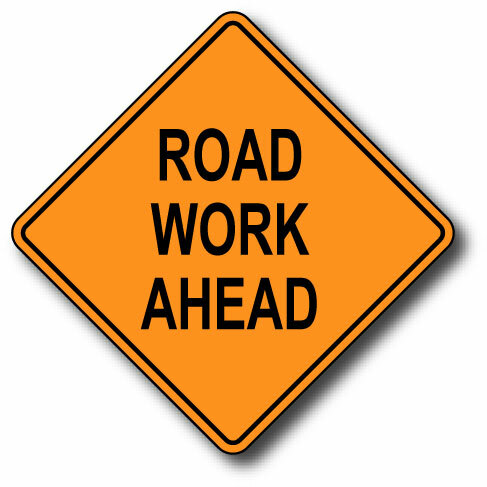 All week I have been redirected by construction signs all over my neighborhood. The road is ripped up; furniture trucks are making deliveries; all kinds of re-routing going on! What if I did not know how to get to work? But, the truth is that the signs are letting me know how to get back on the right road that will lead me to my destination. Whether young old, the more we walk with the Lord the more we recognize how the "road less traveled" is often intercepted so as not to allow us to reach our end, our purpose. The Apostle Paul said that he "fixed" his eyes on Jesus--he had every intention to finish this race; to arrive at this glorious destination. 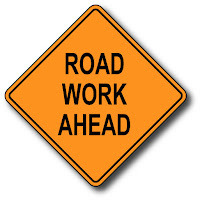 The construction signs on the road this week were intended to point me in the right direction. If I choose to leave the route; if I begin to complain that the road is bumpy or that I have to make to many turns--I might miss my destination or at the very least arrive frustrated. Again, in the Book of Hebrews we read "for the joy set before him" speaking of Jesus; He stood the course. He was tempted by the devil, disowned by the disciples, mocked by men and his own Father turned his back on him. If there were not enough--he was crucified for sinful men! But, glory to God, he stood the course! We learn from the Master; the Apostle Paul gleaned from his Lord and was able to remain. How is the road you are traveling on today? Are their bumps, redirection signs, closed roads, perhaps their are flags waving letting you know you are going to fast--slow down, stay the course. Look closely, the Author & Perfecter of our faith is motioning us toward the finish line. Good thing we know where we are going, right? He has made it so that no matter the bumps, if we stay the course we will indeed be welcomed home. 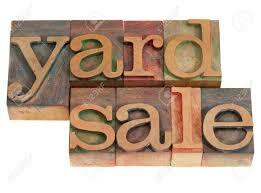 Sunday on my way to church I noticed a sign that seemed to point toward a cemetery and it read, "yard sale". Yard Sale--what on earth would they have to sell? What do we have that God has not given to us? Is there something you possess or enjoy that has not been provided by the Lord? Well if we understand that every good and perfect gift comes from the Father above (James 1:17) then we can surely say the answer is NO. Everything is provided by our Creator. What do the dead have to sell? Obviously, I am being silly for we know when we leave this earth we take nothing with us. So if indeed this sign was pointing toward the grave yard--the profits of the day would be pretty poor. Ah, but wait until the Lord returns and a worth that has been poured into lives is revealed-- then that grave yard will be hopping! The dead in Christ rising as the Lord makes his entrance! Yeah....now we have something of worth that has kept us during the days we were alive. Mortal flesh being transformed; "for the Lord himself will come down from heaven, with a loud command, with the voice of the archangel and with the trumpet call of God, and the dead in Christ will rise first. After that, we who are still alive and are left will be caught up together with them in the clouds to meet the Lord in the air. And so we will be with the Lord forever. Therefore encourage one another with these words" (1 Thessalonians 4:16-18).The Redeemer poured out his life on us--literally his blood to purchase mankind for himself. See, we really possess nothing--but if we have surrendered ourselves --God possess us! While on earth, all that he has entrusted to us is for us to share; to make sure no one around us is naked or going hungry. We can't fix the entire world, but we can just start with the ones God has put within our reach. Bring someone lunch today; give away some clothes--not the one with rips, but the ones you really like. Let nothing possess us! Someone needs a day of rest--if you can, set it up and bless them. On a personal note, I am looking forward to spending time with my two sisters, Betty & Iris. It seems we never spend time together--life continues to move and we don't stop. Well, if God wills, we are stopping and I am looking forward for a time to rest and laughter with my sisters. My mom has been called to glory so we want to celebrate her memory. Ooooo I can't wait! A yard sale at the cemetery has nothing to sell. What we find is a hidden treasure that no man can buy. We discover that the dead in Christ have had a transformation that redeemed their lives; One who paid the price and has made sure we are his forever! We are not for sale--we have been purchased by the Master! The next time you drive by a cemetery, remember--soon there will be a party going on! The dead in Christ have taken this gift of eternal life with them and soon the transformation will be evident to all! The dead bones will rise! At first it could not be identified. I’m marked by an ugly red stripe. Once you take a closer look you realize its bringing destruction to the flesh, along with pain and shooting electrical stings. As the blisters appeared and the red patch surfaced more clearly it was finally diagnosed as shingles. That’s me—this week! It’s possible that I was infected as early as last week. But it took time to emerge and by then it’s too late, you must let it run its course. At first I just endured it. Now that I know what it is I am on the attack mode! When Sin visits at first we may not be able to identify it. Sometimes we can be tricked into thinking it’s no big deal. We may entertain the thought that we can handle it and that no harm will come of it. If we leave it to infiltrate our lives soon this "soul eating - spirit diminishing - peace devouring " disease will consume us. There will be pain and regret if we let it travel and make itself at home. It’s viral; a virus spreading information for your demise. The Scriptures says that we are the ones that make Sin feel at home. There is a desire that gives birth to sin and sin when full-grown gives birth to death (James 1:12-16). As I look back, one of my first thoughts was that it might be shingles; even my first emergency doctors’ visit noted that. But there was a second guessing which purchased me two more days of grief. On Monday, I visited my personal doctor who knows me well; she said, “You have shingles”. She quickly put me on an anti-viral medicated to halt the process of this virus in my system. When it comes to sin, second-guessing leads us further down the path of destruction. Not sure if it’s sin? The Bible says, that the Holy Spirit will tell us. But what if our sensors are dull; lost their ability to hear from God because of the state we’re in? Ask a friend or someone you trust to help you identify the sin. We may not have a red mark or blisters spelling it out—“you’re in sin”! But often the identifying markers are a withdrawal from church involvement, reading the Bible, praying and worshiping. We find ourselves distant from the Doctor, Jesus himself! Before the sin virus continues to spread and destroy our flesh and spirit—get the antidote. Confession will set us free. Run to the Doctor there is no waiting line. He’ll take us right in to his presence. The antidote will free us even though the marks of sin may remain for a while. In time, the flesh, the heart, the mind and spirit will be fully restored. He makes all things new, we just have to ask and confess. The Shingles have halted. The flesh is healing, may take another couple of weeks. I am reminded once again that God has given men wisdom and all healing comes from him. He is Jehovah-Rophe. He not only heals, healing is what He is! He is the Healer!